What is a SQL Trace Flag? A SQL Trace Flag is an indicator that changes the way the SQL engine reacts. Why would we want to that? Well because the DBA always knows best, uh well actually because the standard behavior of the SQL engine will not always give the best possible performance for a Dynamics Ax ERP. Which SQL Trace Flag could be of interest for a Dynamics Ax Database? Well I found 5 that work great for some situations. (-T1117 -T1224 -T2371 -T4136 -T4199). Yes I said “some situations” because which SQL Trace Flag can be enabled depends on lots of things, and should be decided carefully. Let me inform you about these 5 SQL Trace Flags. When you divided the TempDB in multiple data files to match the number of CPU cores as recommended by Microsoft for Dynamics AX, SQL Trace Flag –T1117 comes in handy. It will change the standard behavior of auto growing database files in a file group. The standard behavior is to auto grow one of the files at a time. With this SQL Trace Flag enabled all files in a file group will grow simultaneously. 1 db divided in 4 data files with an initial size of 100MB and an auto grow of 20MB each. When your reaches the 400MB and all 4 files are full, one of them will auto grow to 120MB. But the next data will be written in the file with the freest space. Guess which one that will be…. The one that grew off course. Now the same example with SQL Trace Flag –T1117 globally enabled: When your reaches the 400MB and all 4 files are full, all of them will auto grow to 120MB. The next data will be written in the file with the freest space. Guess which one that will be…. All of them. Should we enable this SQL Trace Flag this minute? No, there is a drawback. This SQL Trace Flag is great for the TempDB but it affects all data files of all databases in the instance. They will simultaneously grow if they’re in the same file group. So think before you act, if you don’t want the files to grow simultaneously put them in different file groups, or don’t enable this SQL Trace Flag. SQL Trace Flag T1224: Running big operation during the day. When running big operations (5000+ rows) during the day, like master planning, they could be blocking your users from doing their daily business. This is due to lock escalation. SQL locks a page to make sure only one process effects that page at a time. When a certain number of pages of a table are locked by the same process SQL can decide to lock the table if this is less costly on memory. This will make all requests for pages in that table wait till the first process is done. SQL Trace Flag -T1224 Disables lock escalation based on the number of locks. However, memory pressure can still activate lock escalation. No, if you don’t need to run big operations simultaneously or with users in the system, you’re probably free of blocking by lock escalation. And lock escalation will have a positive effect on the performance of your SQL. So please plan large operations carefully outside office hours where possible. The SQL query optimizer uses statistics to create query plans that improve query performance. 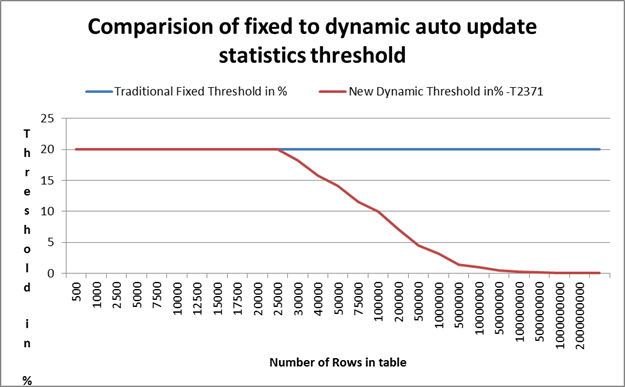 Performance of Dynamics AX depends largely on up-to-date statistics. That’s why it is recommended to set “Auto update statistics” on. But when will the statistics be updated? Well when 20% of the rows are updated/inserted. This SQL Trace Flag is only available on SQL Server 2008 R2 SP1 and all later versions. There was a small update to this SQL Trace Flag in SQL Server 2008 R2 SP2 and SQL Server 2012 SP1 that makes it more precise. On a table containing 1,000 rows the statistics are updated when 200 rows are updated. And the same table after a while containing 1,000,000 rows the statistics are updated when 200,000 rows are updated. Did you read that right? Yes you need to update 200,000 rows till the statistics are updated. Imagine even larger tables. We all know that in an ERP like Dynamics AX these large tables are pretty common. Microsoft also recognized that and released SQL Trace Flag –T2371. This SQL Trace Flag will make the 20% rule a dynamic percentage rule that kicks in at 25,000 rows. No, first examine if your database has a lot of large tables (above 100.000 rows is a good rule of thumb). Without large tables this SQL Trace Flag is useless. Dynamics AX uses parameterized SQL statements if we don’t use the ‘Forceliterals’ parameter in AX. I personally have never seen a developer who fully understood the working of ‘Forceliterals’ let alone use it in code. It even is best practice not to use it. Why? Well when using parameterized SQL statements the query plans are cached and reused. SQL Server will use one plan for all similar queries instead of compiling each query. This can significantly reduce CPU overhead and improve throughput. That sounds like a good thing and it is. But there is a drawback, if the queries are complex and/or the data distribution on the columns against which the parameter is compared vary, the cost of different plan choices can change. A plan that is optimal for one parameter value may perform poorly for another value. The query optimizer still needs to estimate the selectivity and cardinality of predicates using a parameter value. In Dynamics AX especially from version 2012 on the queries are almost always complex. One way to avoid parameter sniffing is to put the OPTIMIZE FOR UNKNOWN option to all SQL statements leaving AX. Another way is to enable SQL Trace Flag -T4136. This SQL Trace Flag is only available on SQL Server 2008 R2 Cumulative Update 2, SQL Server 2008 SP1 Cumulative Update 7 and SQL Server 2005 SP3 Cumulative Update 9 and later. And SQL Server Engine will solve it by doing a full table scan because almost all records are needed. Next time we do the same loop in the other company due to the parameter on dataareaid (and partition in AX2012) the query is identical. That is why SQL Server will solve it in the same manner, with a table scan, where a page scan could be more appropriate. If only SQL could store a queryplan per dataareaid…. No, because Microsoft provided a way to use parameters but not for dataareaid (and partition in AX2012). This makes SQL server store a queryplan per dataareaid, making SQL Trace Flag T4136 completely unnecessary. You can find more information on the blog of Dynamics in the field. Microsoft turned off All query execution plan updates/hotfixes by default to make sure that an update will not affect the way your query executes. Several of these hotfixes will positively boost performance for Dynamics AX. Microsoft controls all future query processor fixes that are scheduled to be ‘On-By-Default’ in a later release with trace flag t4199. This SQL Trace Flag is only available on Cumulative update package 6 for SQL Server 2005 Service Pack 3, Cumulative update package 7 for SQL Server 2008, and Cumulative update package 7 for SQL Server 2008 Service Pack 1 and all later versions. No, there is are 2 drawbacks. 1: Your DBA will send you off to an insane asylum because of the next drawback. 2: If you enable this SQL Trace Flag you enable all future hotfixes/updates to the query execution plans, because we all know you’re going to forget about enabling this SQL Trace Flag.